Addresses and Purchase Order No. "Never an easy subject but the trainer was a breath of fresh air! He set the scene, was warm and friendly but very professional, really took an interest in individuals, delivered with a very calm approach and warned staff when a potentially heavy element was coming – all in all everyone learned loads and I want to get my dates set for early next year to book him in again!" SAFE are pleased to announce we now run open house safeguarding training courses from our very own training venue (Suffolk, IP23 7HU). For information on upcoming courses, please click here. 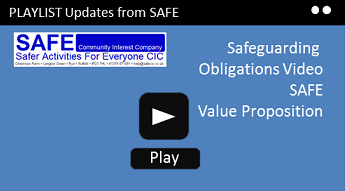 SAFE provides a wide variety of safeguarding related courses to organisations of all sizes, across all sectors. Whether you are a leisure sector, care sector, healthcare or education provider, chances are we will have a course to match your needs. And with our experienced trainers - all selected for their professional multi-agency backgrounds as social workers, head teachers, police officers and Ofsted inspectors involved with safeguarding, we are able to bring a wealth of experience that our clients and partners can capitalise on. For bespoke Face to Face Training to meet your own in-house needs, Please follow this link. Target group: This course is a “must” for all those who work or volunteer directly with children, young people, and/or their families. It is carefully designed to ensure your staff know everything they need to - from having a concern, confidentiality, recording and referring to your senior leads for safeguarding. It complies with the latest staff training standards for Ofsted and CQC. Target group: This course is a “must” for all those who lead or deputise for safeguarding, or manage staff and volunteers working directly with children, young people, and/or their families. It is carefully designed to ensure managers know everything they need; from having a concern, confidentiality, recording, managing staff allegations and making referring to both children's social care and / or the police. It complies with the latest staff training standards for Ofsted, CQC and GDC. All participants receive a comprehensive training pack and SAFE Certificate, valid for 2 years. This course is designed for all those who work or volunteer directly with disabled children, young people, and/or their families. NSPCC research tells us that children and young people with a disability are 3.4 times more likely to be abused than those without a disability. Therefore, it is critical for all those who work with disabled children and young people to be vigilant and aware of relevant safeguarding issues. ensuring there is an equality of service delivery and experience of service provision for those children and young people with a disability. All participants receive a comprehensive training pack and SAFE Certificate, valid for 3 years. This is a specialised course, which will build on your existing knowledge achieved from our Standard Child Safeguarding training. Target group: This course is a “must” for all those who work or volunteer directly with adults at risk and/or their families. It is carefully designed to ensure your staff know everything they need to from having a concern, confidentiality, recording and referring to your senior leads for safeguarding. It complies with the latest staff training standards for CQC and reflects the Care Act 2014 and statutory guidance. Keeping safe on-line is the latest emerging risk that young people have to manage when using new technology. Increasingly, adults are concerned about how to keep young people safe online. SAFE CEOP Ambassadors have developed this course to provide training so that participants can then access the excellent CEOP resources available for working with children and young people aged 5-16 years. Please Note: CEOP regulations stipulate that, on the day, participants either bring their own copy of their enhanced CRB/DBS certificate or a letter from their employer/senior management confirming they have been rigorously recruited to work with children and young people. Target group: This course is a “must” for all those who work or volunteer with people with dementia, their families or carers. It is carefully designed to ensure your staff know everything they need to from having a concern, confidentiality, recording and referring to your senior leads for safeguarding in relation to people with dementia. It complies with the latest staff training standards for CQC and the Care Act 2014 and statutory guidance. Target group: Aimed at all those who recruit staff and volunteers to work with children, young people, adults at risk and their families this course is a must for all managers, trustees and HR staff. Participants will receive a certificate valid for 2 years. This course is worth 4 CPD hours. Worried about Child Abuse or Adult Abuse? If you are worried about a Child, please click this link. If you are worried about an Adult, please click this link. Remember, in an emergency, always dial 999.